KÖLLEMANN Cooling-Screw-Conveyors have their field of application within the cooling of bulk-solids, pastures as well as sludges and slurries. For each special application and bulk-solids conditions, we offer custom-tailored variants. KÖLLEMANN Cooling-Screw-Conveyors represent the ideal solution for any application, where gentle handling and rigid separation of the bulk-solid and and coolant is mandatory. KÖLLEMANN Cooling-Screw-Conveyors are universally usable for bed-ashes, flue-dust, sewage-slurries, cements, salts, plastics, pyrolysis residues, cyanideor pastures in every kind of condition. 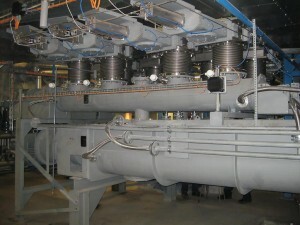 Based upon their sophisticated design, KÖLLEMANN Cooling-Screw-Conveyors differ mostly from other products available on the global market due to the well-proven Hollow-Flight-Principle, which incorporates some advantages: significantly increased heat-transfer-surface and a relevant lower thermal stress for the screw-flights as well as a forced guiding of the coolant within the shaft and jacket. The application- and temperature-range reaches up to 1200°C, by a consequent cooling of all heat- and product-exposed surfaces a low thermal stress and an endurance can be achieved. The applications are unlimited -a direct-discharge from a fluidized-bed combustion is for Köllemann Cooling-Screw-Conveyers as easy as the usage within a cooling-cascade built from several machines to temper a big volume-flow gently. The usability for applications which require sticky, bridging or adhesive solids and pastures is maintained by a sophisticated design of the shaft geometry and movement which is known as the KÖLLEMANN Self-Cleaning-System. Through our experience we can handle problematic products reliable and within the boundaries of your processes.